The Queen and The Duke of Edinburgh visited Glasgow on the fourth day of their annual week of Scottish engagements. They attended the opening of Strathclyde University's Technology and Innovation Centre and the openings of The Queen Elizabeth University Hospital and The Royal Hospital for Children. That's definitely a stray bit of Muppet fluff on her hat, but I still love that cornflower blue with the darker sapphire and pearl of Empress Marie Feodorovna's brooch. Delicious. 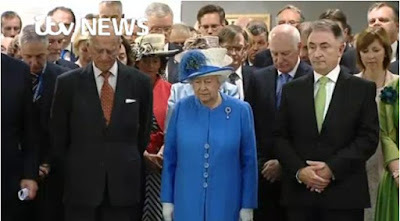 Observing a moment of silence for the Tunisia victims. Click here for video.